The punishment, for most infractions in the House of Fiddle, would be a “time-out.” Which honestly, the whole “time-out” is more for the parent’s fragile state of mind (mine), than for the misbehaving child.Emme was easy. We only had to threaten her with time-out, and she would fold like a deck of cards. Cailey came along, and she was a harder sell. She grew to dislike time-out, mostly because she was deprived of a sibling to torture while trapped in her room. All alone. Then Jensen made his entrance. He has made me rethink the whole “no spanking rule.” Every Single Day. Jensen, who just turned 3, is the size of a smallish 5 year old. He still sleeps in a crib. His time-out takes place in his crib. Otherwise known as prison. He has no idea that he not only possesses the capability of climbing out of his cell, but that he could also disassemble it and fashion it into a bomb. He was sentenced to time-out for repeatedly swiping Cailey’s favorite doll, running from her, sliding on his belly (risking carpet burn), to shove her doll underneath the TV armoire. As far as he could reach. Just to torture her. I’ve often told Cailey that she needs to seriously make friends with her little brother. Because there will come a day when he can totally take her down. That day is upon us, my friends. So, I placed him in his jail cell, and went back to the kitchen to set the timer to 3 minutes. The defendant is sentenced to one minute per year they’ve been alive. Sometimes I take into account life expectancy, and add on time. Especially if I’ve forgotten to set the timer. And Oprah is on. Or I have a headache. Just sayin’. Dang it all to heck. He scaled the prison wall. Fiddledaddy came in a little while later, and was recounting a work issue, or somethingorother. I stopped him with raised hand, “Forget it, we have bigger fish to fry.” And I went on to tell him about how his son finally figured out how to climb out of his crib. At first, I thought I saw fear in his eyes. Which gave way to pride. His boy. As Fiddledaddy was rocking his little Rambo to sleep, Jensen began bragging about his newfound skills. Visions of a midnight jail break danced through his father’s head. Yet more lost sleep. The warden and I rummaged through the garage to find the crib net that Trish bequeathed to us after her youngest boy had grown into a big boy bed. We assembled it onto Jensen’s crib and began the arduous job of soft selling it as his new “car bed.” I’m unsure if he actually bought it, or was just too exhausted to fight. Personally, I think he is biding his time, and is just trying to figure out how to disassemble this new net thingy and build some sort of trap for his unsuspecting sister. Because they are, after all, cut from the same day-glo orange jump suit kind of cloth. I’m pretty sure that this story will continue. But, I’m placing myself in a much needed “time out.” And at my age, the time to be served could be considerable. Jonathan and Kati both accomplished this feat around the sme age, and lawsie have mercy, did my life change for the worst. Their dad worked noghts, so about the time I would finally get them to sleep, then get me to sleep- they knew it was time for dadd to get home. And feed them veggie beef baby food. So, they would fake me out, wait for me to collapse and then the house was theirs. At the time, I was a heavy sleeper (no doubt the running after two babies, 14 months apart who never napped together and ran all. fllippin. day. long had anything to do with it), so only God kept them safe from burning, breaking or whatever. You will survive, my friend. My advice? Two simple words. I remember the first time my dd escaped from her crib. She was throwing an all out huge fit of gigantic proportions. I still don’t know if in her fit she fell out, climbed out, jumped out, or maybe flew out – but all of a sudden she was out of her room – so something happened! I wanted to do the whole time-out thing. I really did. In fact, it worked beautifully for my first, I was golden. Then, when my first was 3, I put him in time-out, and his 1 yo brother pulled a chair over to sir beside him, grinning from ear to ear. I knew then I was in trouble! Oh.. see… us spankers can learn a lot from you. They grow out of spanking… but they don’t grow out of the need for restraint… discipline…QUIET TIME!! Oh.. here comes my little guy now… 30 whole minutes early. I’m sending him back to jail — uh — bed. oh my good luck with that. I always wondered what “baby gates” are for…my 3 little charmers simply viewed it as an obstacle to climb over. Except my youngest son who started jumping over it not too long after he started walking lol. I have always said that my youngest child is proof God has a sense of humor. 🙂 Let’s just say I dress him in all orange for a reason. hehe. Daddies are proud of the craziest things! My 18-month-old just learned to climb out of the Pack’N’Play. I’ve also seen him throw one little leg over the side of the crib, so I’m terrified that’s next. Please let us know how you like the crib tent! And good luck! My youngest two are 15 months apart and at one point, they both slept in separate cribs. In my bedroom. And our bedroom isn’t that big, so a full-size bed and two cribs, one on each side of the bed, made it a little crowded. What was really bad, though, was when the youngest (at about age 2), learned to climb up onto the edge of his crib and jump. His favorite place to jump was directly onto my head. In the middle of the night or five minutes before the alarm was set to go off in the morning. My daughter didn’t really climb out of her bed as much as she would hold on to the crib railing and jump up and down, singing at the top of her lungs. They also played jump-up-and-down and scream peek-a-boo with each other. oh boy! I hope you find a way to make him mind. Sounds like you have a Houdini in the midst. It’s just too ironic that you used the jail analogy because that’s exactly how it is. We run a men’s ministry of troubled men and that is their exact mentality. Go to time out, ok I’ll just escape. I’ve never seen a net like that before, except over the deli tray at a picnic. I’ll bet it helps keep the mosquitoes out. I want one over my bed! Oh woman… that thing is going to be torn up in no time. My kids much prefer a spanking to a screaming at… but they would LOVE time out! They are avid readers and are known to hide books under their pillows with little flash lights. Not only that, but Morgan has begun to realize early that naps are actually FUN. Drat! She’s only 9 and already has discovered what adults everywhere have known for centuries… the siesta is actually a GOOD THING. Being sent to her room during school hours would be a reward! Good thing my kids like video games. That is the only thing we can take away that will bring tears. So when they haven’t done something evil and rotten (direct disobedience, lying or hitting someone else would qualify), we resort to grounding them from “screen time”. Works like a charm. Now if only Daddy could figure a way out to use grounding from blogging on Mommy… maybe I wouldn’t ever end up NOT COOKING and forgetting to get the car inspected quite so often. 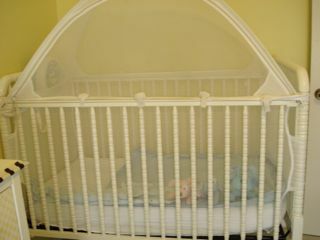 His ability to stay in his crib this long must be due to the fact that he has two older sisters! Girls are a bit less monkey like if you ask me! Now my third child is a girl and she has two older brothers, my sweet girl could scale the crib walls at 11 months! We had to put her on a mattress on the floor so she wouldn’t break her neck! I hope the net works, I really do, or you are going to have a little visitor tonight! Crib tent worked for us but the older 2 weren’t willing to unzip it – I’m not sure about yours!! Been there. That net won’t last. I suggest heading to Home Depot for some rebar, welding tools and concrete. The youngest of our seven were little escape artists and being the youngest in a large family, weren’t always on my radar when they bailed out (I had put them down for naps, after all!). I didn’t have to time to sit/stand there and watch them go to sleep and didn’t want to spank them everyday for who knows how long… So, I found in my closet the sash on my fluffy yellow robe, tied it to the ankle and the far corner of the crib. It was too short to strangle them, but long enough to give them full crib range, and they couldn’t swing the leg up over the side. Staying in bed for a nap was no longer an issue, what a relief! Our youngest, however, did become an expert at untying knots and has loved puzzles ever since! Don’t ask how I know this technique. My lips are sealed. I KNOW I will be needing a crib tent in the near future…. Apparently, I was climbing out of my playpen before I could walk. It looks like you are in for an adventure! Duct Tape. It fixes everything! You lucky woman – you made it to 3 years! My little Dude climbed out of his crib at 9 months old . . . he had one of those convertible cribs with a dresser attached to one end. I went in there, and he was standing on the dresser! Crib disassembled and reassembled as bed . . . portable bed rail added to side of bed. Then he got tall enough to open the door. So we had to turn the handle around so the lock part was on the outside in the hall . . . we locked him in from the outside or he woulda been running around the house at all hours of the night! When my daughter was born, we got the crib tent to keep the cats out. By 2 years old she had figured out how to undo all the velcro around the crib and collapse the tent on herself. We thought we’d try it on our son, too. He turns 2 this week and last week he reached around the railing to unzip the dang thing. No wonder my kids are in bug kid beds by 2 years old. On the plus side, all their books are in the bedroom, and they love to read/look at them. « What Do You Know?